Chances are, you've already had run-ins with your Outer Child-the self-sabotaging, bungling, and impulsive part of your personality. This misguided, hidden nemesis blows your diet, overspends, and ruins your love life. Your Outer Child acts out and fulfills your legitimate childlike needs and wants in the wrong place, at the wrong time, and in counterproductive ways: It goes for immediate gratification and the quick fix in spite of your best-laid plans. 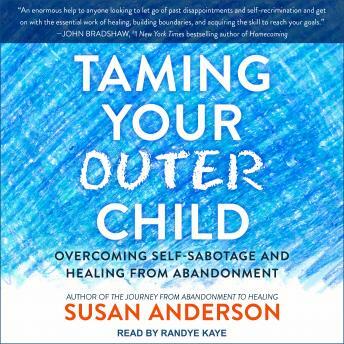 Now, in a revolutionary rethinking of the link between emotion and behavior, veteran psychotherapist Susan Anderson offers a three-step program to tame your Outer Child's destructive behavior. This dynamic, transformational set of strategies-action steps that act like physical therapy for the brain-calms your Inner Child, strengthens your Adult Self, releases you from the self-blame and shame at the root of Outer Child issues, and paves new neural pathways that can lead to more productive behavior. The result is happiness, fulfillment, self-mastery, and self-love.